This train terminates here . . .
I’ve been away for quite some time. Not physically, you understand, although the same level of travelling around the world applies, as ever, but in writing terms. A lot has been happening in the world of Backup Exec and its left me with little time to sit and think and write. For that I can only apologise but its all been in the name of a good cause. If you’re reading this then you are probably aware that Backup Exec 2012 has been launched. Its significant. It brings change, but not just change for the sake of change. It brings change that makes life easier. I urge you to familiarise yourself with the changes. I moved from a Blackberry to an iPhone a little while ago and its a bit like that. Different, but better and it took no time at all to get into a new look and feel. While I’m on the subject of change, its change time for me too. For the last eleven years I’ve been looking after Backup Exec in one role or another and that’s a long time in anybody’s book so its time for something new. I had an offer that came out of nowhere really. But wait, it’s not game over. I’m getting off this train, but I’m getting on another train. 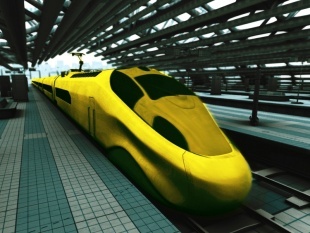 Another yellow train – in fact another Backup Exec train. One of the areas we talked about as part of the recent product launch was the Backup Exec Appliance. I’ve mentioned it here before, and no, at the time I didn’t know I’d be changing roles, but that’s what I’m picking up – the Backup Exec Appliance business. It follows the path of what I really believe in when it comes to protecting data – two things: it’s not about backup and restore; firstly, it’s about making life easier, better and secondly if I’m a company that builds boats it’s about helping me to build more boats. Plug and play, all in one place, done for you. You focus on what you do as a business, I’ll focus on what I do. So now when you think about protecting your data and you get to the software bit, you just have to decide whether you want it to arrive in a box, or on a box? With Backup Exec 2012 both options are easy. Perhaps one will turn out to be more easy than the other. Your call. Arriving at the airport I simply asked an airline attendant whether I needed to print my boarding pass at the kiosk, since I hadn’t needed to last time. What I thought was a straightforward question was greeted with a look of disdain and a “yes at the kiosk, but why are you standing over here?” i.e. in this ‘premium section’ of airline check in. “Well,” I responded, “I do have a gold card.” All of a sudden the lights appeared to come on, doors opened and there was a little private fanfare all just for me as I was waved through to have my boarding pass printed for me at a desk with no queue. Odd, really. Aren’t I just the same as all the people queuing in the regular queue? That got me thinking. Perhaps I’m marginally more valuable to my favourite airline than the occasional traveller. Maybe they’d like to retain my loyalty in a way so many business fail to do these days, despite the current economic climate. When I sit working on flights, or in the office for that matter, I don’t treat what I’m doing with equality. Some pieces of work are definitely more important than others and there’s a natural tendency to treat more lucrative or personally beneficial pieces of work differently. So why is it then that it looks like my work, when its just ‘data’ is treated equally? If I delete an email in error and can’t get it back myself I genuinely struggle. If there’s a problem with a document on a file server I can probably get by for a bit longer without it. So what do I want from my IT organisation? I want them to prioritise the information that’s important to me, when I’ve messed it up or when there’s been a problem. I, like so many users, am not interested in whether there’s a hardware problem, or a network problem, or if the virtual server that Mr.IT is migrating to isn’t playing nicely today. Whether its me deleting something or not, this is business. Or it would be if I could get my information back! Maybe Mr.IT views it differently though. He doesn’t care whether one piece of data is more important to me than another. I suspect what he wants is the ability to take a look, find what he’s after and do something useful with it. If it’s on a file server, an application server or a database isn’t it all the same thing really? What about the machine itself. One manufacturer or another, one operating system or another, physical, virtual. Should it matter? Its all about meeting needs. The airline meets my needs as a frequent traveller by making life a little easier for me at the airport and maybe on the flight too. IT makes my life easier by being flexible. If they’ve got the same capabilities across all data I need them to help me with then it’s up to me as the user to decide what’s important to me right now – what I need restored as a priority. They don’t have to worry about what they can and can’t do depending on what I’m asking for this time around. They’ve got visibility into it all. They pick and choose. I benefit. By the way, I’m in Florida for the global Backup Exec conference the week after next so watch this space!